Jim Davis, I don’t know who you are but I like you already. Pumpkins are the harbinger of the harvest season, appearing every year as the first sign of autumn. Did you know that the word “pumpkin” comes from the Greek word “pepon,” meaning “large melon”? Pumpkins can be grown on every continent except Antarctica, and the United States produces about 1.5 billion pounds of them each year. A Wisconsin farmer grew the largest pumpkin ever recorded. He used seaweed, cow manure, and fish emulsion to grow his pumpkin, which weighed a total of 1,810 pounds and was the size of a dumpster! Let me be clear about one thing: please don’t use cow manure and fish emulsion in my pumpkin thankyouverymuch. In case you’re worried, I used organic pumpkin puree. I had a brief, fleeting thought about making my own pumpkin puree. Then I pictured myself standing in the kitchen for hours, laboring over cutting, roasting, and seasoning the pumpkin and I thought better of it. Good thing because Whole Foods had a sale on their organic pumpkin puree, which worked just swimmingly for this recipe. Ladies and gentlemen, if that’s not an endorsement I don’t know what is. I’ve made it big! First make the ice cream base. Pour two cups half-and-half and one cup whole milk into a large pot. While that is heating, begin tempering the eggs. To do this whisk the yolks first, and slowly add in the 3/4 cups of sugar until the yolks get very thick and pale yellow. At this point, small bubbles should be forming around the edges of the milk mixture. Pour in the can of pumpkin and stir thoroughly. Remove from heat. 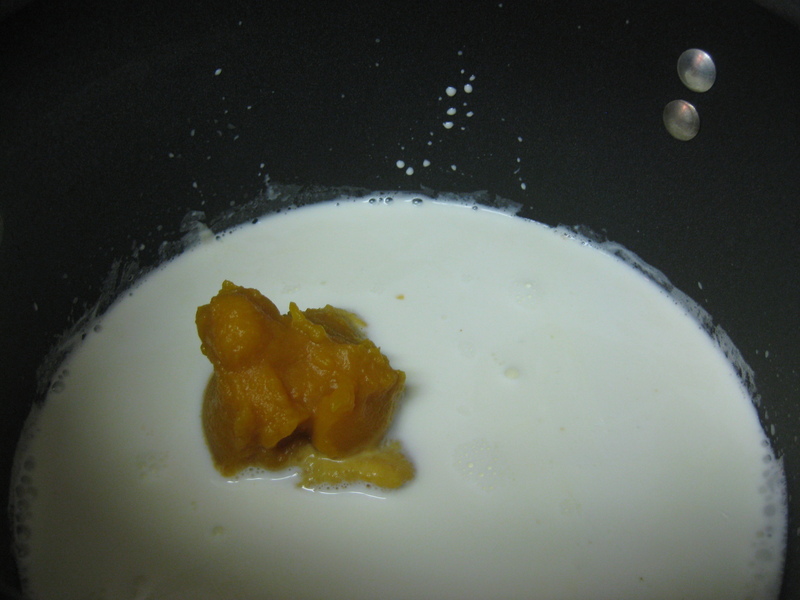 Slowly pour the pumpkin/milk mixture into the egg yolks. Stir thoroughly until well incorporated. Add in the cinnamon, cloves, ginger powder and tea masala. (Personally, I didn’t think that my ice cream was spiced enough, so at this point I should have at least doubled the proportions of seasonings, and then adjusted according to taste – oh well, next time). Pour this mixture back into the pot and slowly heat until the mixture reaches 185 degrees F, or when it is thick enough to coat the back of a spatula. At this point the eggs are cooked. Remove from heat and let cool completely before refrigerating for at least 2 hours. 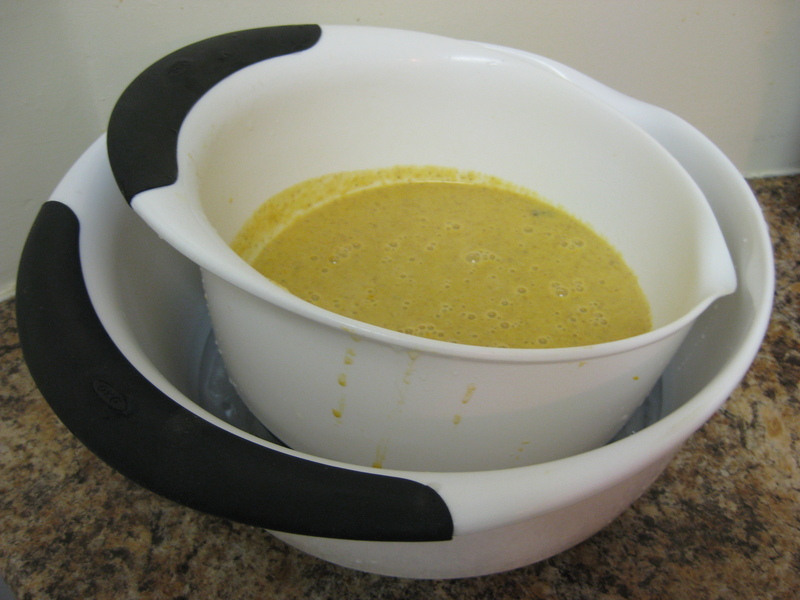 To speed up the cooling process (which I did), you can fill a large bowl with cold water and ice, and rest the ice cream mixture bowl in that bowl (otherwise known as an ice bath). You’ll still need to transfer to the refrigerator, but it definitely shaves time off the cooling process. 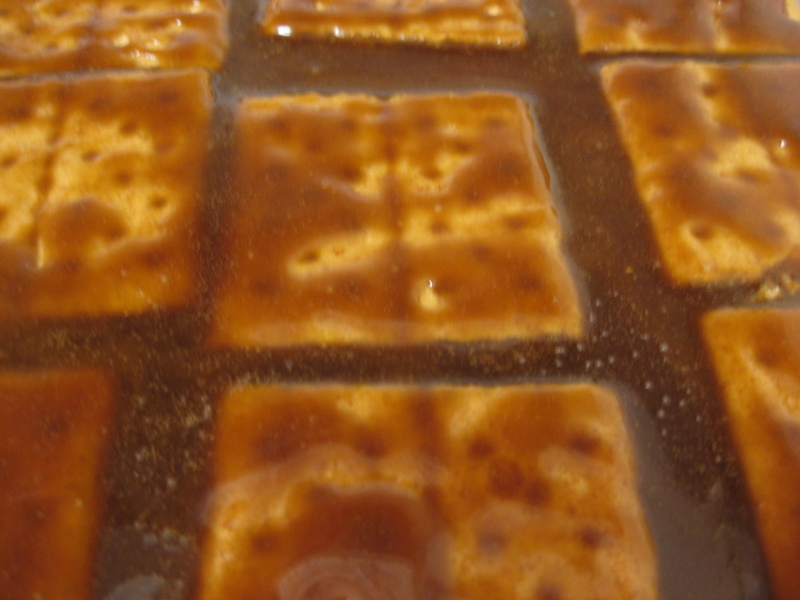 While cooling, make the caramelized graham crackers. Line a baking sheet with parchment paper (an absolute must, or your graham crackers will stick!). 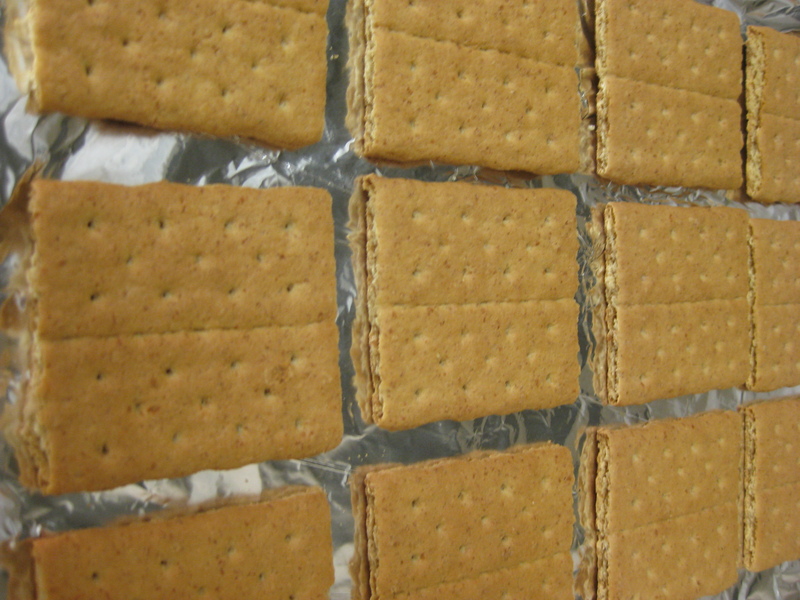 Break the eight graham crackers in half, or in small pieces, whatever you prefer (pieces need to be event) and place on the parchment-lined baking sheet. Preheat the oven to 25o degrees. Mix butter, brown sugar and corn syrup on the stove top and heat until bubbly. Stir constantly so that it doesn’t burn. Once bubbly, remove from heat and pour in the vanilla extract. Pour this caramel mixture onto the graham crackers, mix a bit so the pieces are well covered, and cook at 25o degrees for 30 minutes. Remove from the oven after 30 minutes and immediately take the pieces off the baking sheet (careful the caramel is VERY hot). Set the pieces aside. Once the ice cream mixture is chilled, pour into the bowl of an ice cream maker and churn according to the manufacturer’s instructions. 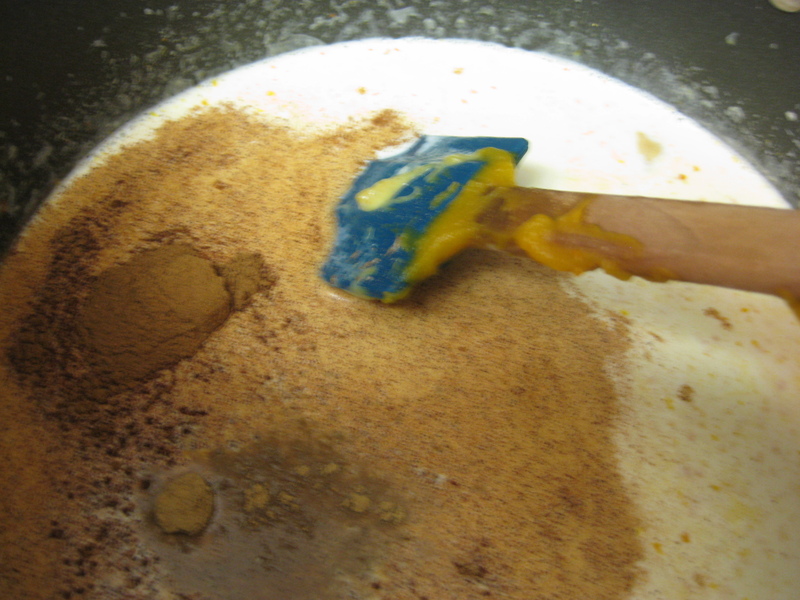 Approximately 5 minutes before the mixture is done churning, slowly mix in the caramelized graham crackers. 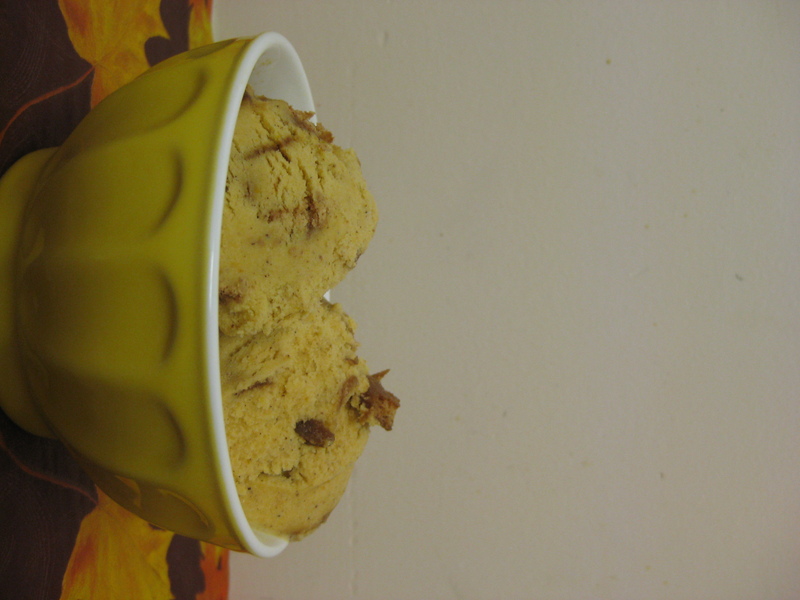 Remove from the ice cream maker, place in a freezer safe container and freeze for 2 hours before enjoying. The Verdict: Well, it was eh. I really hate saying that, but it’s true. I’ve mentioned before that I really love ice creams that pack a punch – and really exude flavor. This one just didn’t. 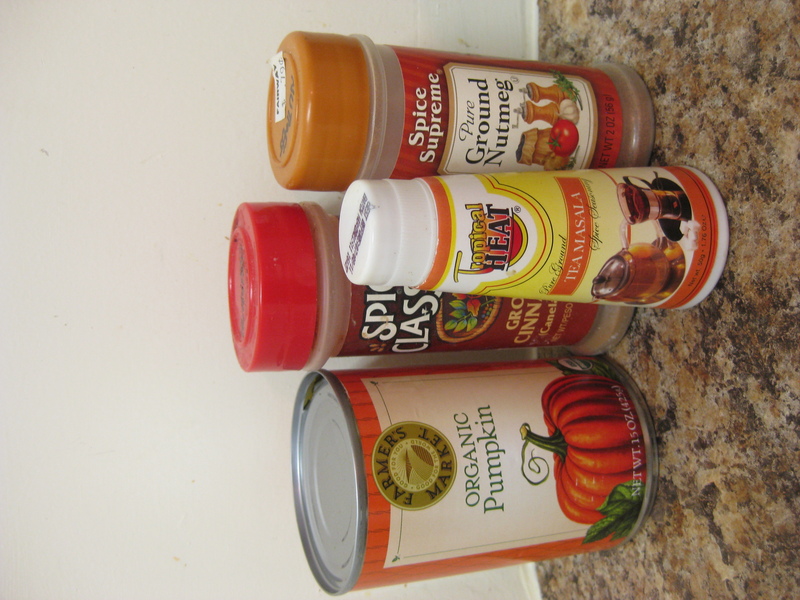 I am not sure whether more cinnamon, nutmeg and ginger would have added to the flavor, or whether the pumpkin to milk ratio was slightly off, but either way, I’m going to try making it again with some slight modifications. Of course I’ll post those for your reading pleasure. But, on a positive note, the caramelized graham crackers were so delicious, and whenever I got a bite of ice cream with one of those gems, it was heavenly. 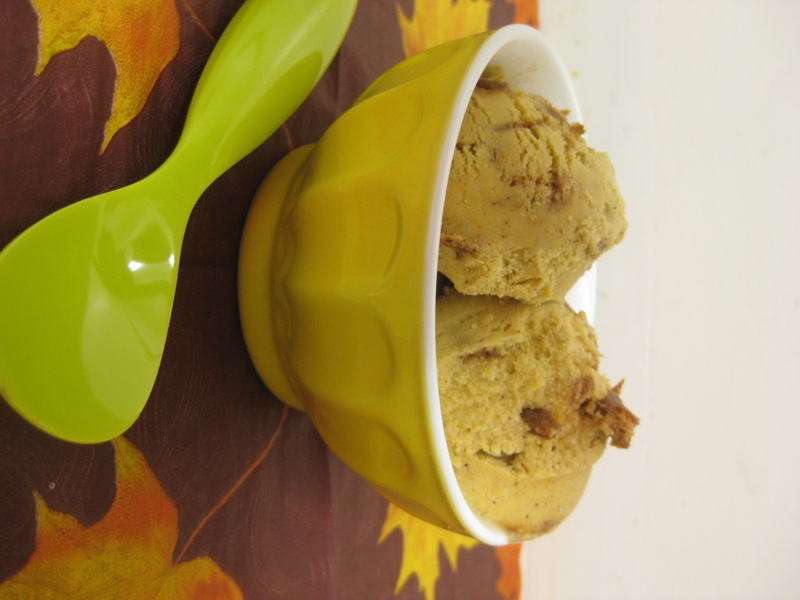 The caramelized graham crackers were a perfect addition to the ice cream, and provided a deliciously sweet crunch. All in, I’d give this a 6 out of 10. Hopefully next time we’ll get a 9 or 10. Either way, it’s still a great ice cream for fall. Maybe your ice cream needed some vanilla. Caramelized graham crackers: what a supremely genius idea! I just got an ice cream maker and my friend pointed me towards your blog and I can’t wait to try these recipes!!!! I’ve been searching around for a Honey Lavender ice cream – if I succeed, I’ll share!